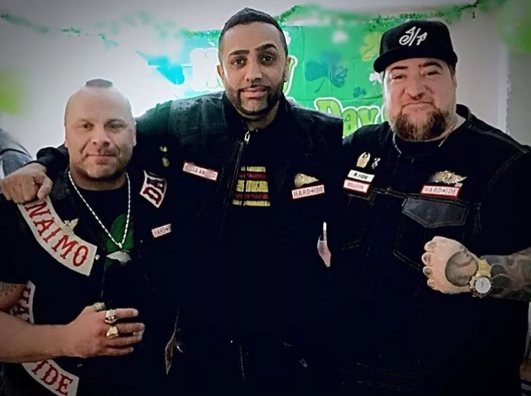 Kim Bolan is reporting that the New Hardside chapter of the Hells Angels is located in Vancouver BC. God help them. Hooking up with a brown guy certainly doesn't make them look cool. Nothing could help these two rejects look cool. Look at the picture they posted. It's like a picture of Huey, Dewey and Louie. Mental midgets trying to look scary. Well it certainly backfired. Now they all look like idiots. No wonder the other chapters didn't want them. What happened to Larry Naicker after he posed for a picture with Larry Amero? Oh right, he was shot dead. Cub pack. Surminder even looks embarrassed standing beside the fro hoe and the duck dynasty decoy. He's thinking they dont pay me enough for this sh*t. We used to make fun of clowns like this back in college. Surminder has more IQ in his toenail than the other two clowns put together. Poor guy. What people will do for money. Some people just have no self respect any more. Pity. if this is what the H.A. is recruiting these days, I'd suggest they aren't going to be in operation for much longer. The one with the hair plug looks like he is from Nanaimo. His ancestors may have spent too much time in a coal mine back in the day. The beard most likely is hiding a weak chin. OMG what a joke these guys are. aS WITH many large corporations, they fade when they don't "hire/recruit" decent employees with some brain matter that works. OMG what a laugh. thanks for sharing. brightened up my whole day. A train wreck waiting to happen. RIP H.A. Are you kidding there is now a hindu a full patch member??? I don't think so. Most of the local Indo Canadians are Sikh. Nor is he the first Indo Canadian member. I believe there is one in Nanaimo as well. However, in this case the brown guy clearly outclasses the two brain dead crackers. DayDreamer needs to get with the agenda. Its 2017 and yes the H.A. has people of colour as members. Its a changing world. Dennis Watson gives a good explaination. so day dreamer try to keep your terms correct, its either Indo Canadian or South Asian, if you're not sure of the person being from Pakistan or India. Using the term "hindu" is so ignorant. There aren't any black members anywhere in the club to my knowledge. Mom Boucher recruited Greg Wooley to sell drugs for him so they could supply all the Crips in Montreal but Greg was never a patch holder. They put him in charge of a puppet club instead. I've seen a Japanese member and they have a chapter in Japan. San Francisco has Latinos but it is a predominately white organization hence the Edmonton Hells Angels endorsement of the Whiteboy posse that used Nazi symbols. There was a Black member in Vancouver. The charters in the USA did not want him as part of the club. He went missing, but after the BC SA (Satans Angels) became HA. Are you referring to Rick (Blackie) Burgess? Mike, buckwheat was his handle. rick was native, born in downtown vancouver. Hi, How do you find out if someone is a full-patch Hells Angel? I stay with my grandparents in the summer in a little village 20 km east of Hope. There are two guys who bully some of the older people and scare them. I don't think Hells Angels would do this. Do you think they would? The Hells Angels have no need to bully people. Bullies have small man syndrome. Full patch members usually don't. Sometimes associates who use the name of he club to sell drugs bully people.